When you think of horrible pond dwelling creatures, leeches are one of those that always come to mind. Their slimy, wriggly, bloodsucking tendencies are always going to be something that will make your skin crawl, and have been used to great affect in many a film; from Stand By Me to any jungle based war movie. So you would think with a title such as ‘Attack of the Giant Leeches’ you would be in for one skin crawling carnival of terror. From the legendary producer of all things schlock and low-budget, Roger Corman, along with Gene Corman bring Bernard L. Kowalski’s Leeches to the screen. A 1959 picture of such ill repute, that it has now become a cult classic of the B-movie world. Set at the height of the cold war in the Florida Everglades, where the heat is high and the yokals are lowly marsh dwellers. The scene is set straight from the off, when one of the giant leeches is shot at by a local trapper Lem Sawyer (George Cisar – The Werewolf ), your typical character with straw hat, dungarees and a moonshine bottle at his side. Seeing the giant leech from the start really doesn’t help this film. With any b-movie the suspense should be built up gradually until the grand reveal at the end and not right at the beginning. What also hampers these slimy beasties is that they are just one step away from a man in a bin-bag covered in pompoms, what am I saying it is a man in a bin-bag covered in pompoms. Anyway, not knowing what he was shooting at Lem heads back to the local store, where the regulars of the community hangout and regales his story of the beast in the swap. As can be imagined the locals scoff at Lem’s claims. However, a more interesting storyline is played out between Dave Walker (Bruno VeSota – The Wasp Woman), the rotund owner of the store and his beautiful wayward wife Liz (Yvette Vickers – Attack of the 50 Foot Woman). Playing out like a would-be classic film noir, with a love triangle between Dave, Liz and local trapper Cal Moulton (Michael Emmet –Night of the Blood Beast ), we get an extra lay to the proceedings. Plus the screen always sparkles when ever Liz appears and adds some needed tension and substance to an otherwise cardboard group of actors. Anyway, apart from the locals at the store, the film does require its hero figure, and this comes in the form of Game Warden Steve Benton, a white bread American hero with a can-do attitude and the acting chops of cardboard. As the locals start to disappear and reappear, drained of blood, around the swamps, Steve runs to the help of Dr Greyson (Tyler McVey), and luckily the farther of his white picket fence girlfriend Nan. With some quick science and looking down microscopes they come to the conclusion that these deaths are the hand of giant leeches, which must have been created by nuclear energy (cold-war paranoia, tick) that can be found at the nearby Cape Canaveral. Though laughed at by the locals and the police alike they start their hunt. Though the best part of this film is still the noir love triangle, and as the affair is discovered by Dave. He forces his wife Liz and Cal into the swamp where they are then promptly attacked by the leeches. Though these leeches don’t kill their prey straight away, they have a secret underwater cave, where they can store their food. So will the Doc and Steve find the leeches’ secret cave and rescue the missing locals or will the bin-bag leeches run riot through the swamps and continue to pick the populous of one by one? This film has all the makings of what could be a great b-movie; atomic cold-war tensions, a sassy bold, strange monsters in the swamp and a what could-be great characters. But though the first half of the film has a great build up and an interesting sub-plot the second half falls into the same old monster hunt routine. 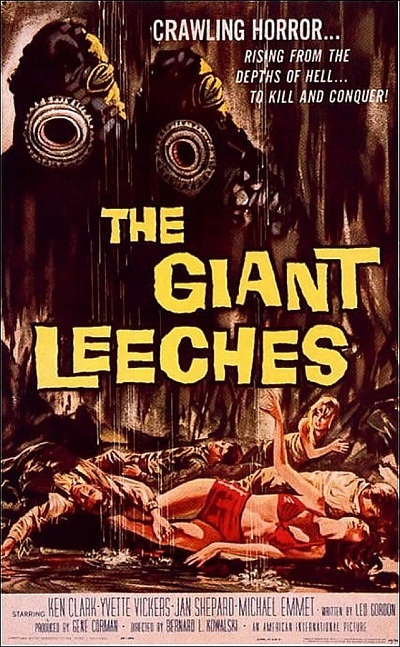 So, Attack of the Giant Leeches, though known as the epitome of B-movies, comes a fair way short of being a classic.